YOU WON’T GET OUR RUIN! In the night from Saturday to Sunday the Golden Pudel Club stood in flames. The roof was destroyed. Also the improvised home of a refugee burnt down, with his papers. The Park Fiction Archive in the top floor is partly drowned in water. The act (in the club were more than 100 guests) as well as the point in time (a few weeks before its foreclosure sale, two days after Pudel announced the wish to transfer it into a foundation) raises concerns. Chance? Idiocy? Calculation? 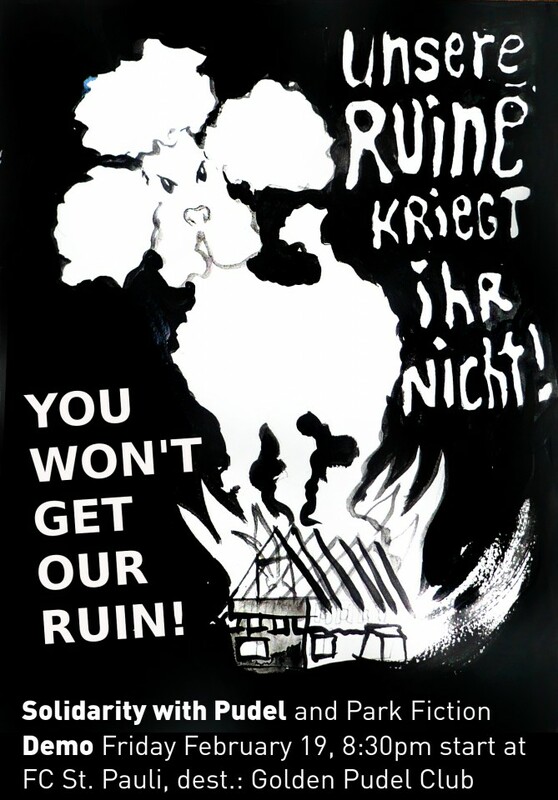 This would not be the first attempt in St. Pauli, to evict users-as-obstacles-of-investment by fire. Just in case, someone plans to take advantage out of the situation: Be warned, moneybags! 3.) an active space in the top floor for daytime use, for the neighbourhood, for hard-to-understand-art, for poodle-booking, discussions, for the Park Fiction Archive, for Right-to-the-City-issues, for subcultures. For example. THIS IS WHAT WAS PLANNED HERE FROM THE BEGINNING – AN INTERWOVEN FABRIC FROM PARK AND PUDEL. For this we have faught together since 1995 – successfully. And we will do that again. The burned dog-shed is surrounded by ruined gastronomy-ambitions in the higher costumer category. All of them failed. You would have an even worse time. And on top this: It is a Drama, that our neighbour Kofi is threatened by deportation. He used to live in the now burned tent in the park, reported to the police as eyewitness. The following day he was arrested, and he is to be deported. That is a scandal. And raises doubts about the thoroughness of the police investigation. Back to Pudel: Once upon a time, a legendary pirate in Hamburg, after being beheaded, managed to run for another ten meters without his head. Also the Pudel Club lives, even without a roof. It has always been held together by love for music, by a krude sense of humour, by dancing feet, by posters without any information content, by philosophy at the bar. Poodles are not only funny and pretty. They can bite as well. supported by Park Fiction Komitee, Ultrà Sankt Pauli, Interventionist Left Hamburg, Zeckensalon and more Neighbours, Fangroups of FC St. Pauli and Culture- & Community-Initiatives.